Cones of strawberry-sundae coloured blooms will lift your late summer borders. Huge flower cones of pink and white from July to September - if a strawberry sundae could look like a flower, it would be this one! A must for any lover of Hydrangeas, the fabulous flowers change colour as they age, from white to rich raspberry red, through a multitude of pink tones. Branches are red-blushed, adding more depth of colour to your borders and pots and really making the flowers pop. Add late summer colour to your beds, borders and containers. Supplied as an established plant in a 12cm pot ready for planting out. The exuberant flower heads of Hydrangea 'Vanille Fraise' are what transform an ordinary paniculta hydrangea into an extraordinary paniculta hydrangea! Turning from vanilla-white, through shades of pink as they age, to a sumptuous rich raspberry pink, these cones of starry flowers are an absolute dream! 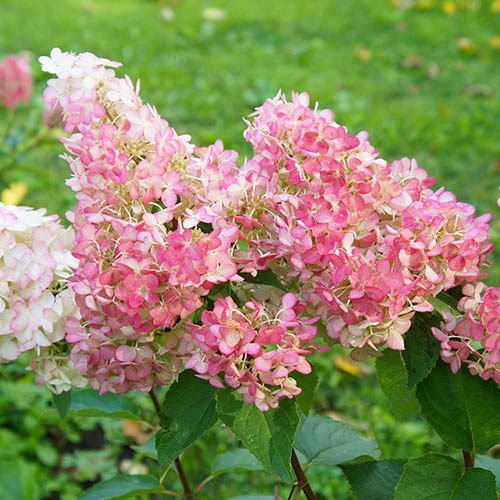 With flowers of many different shades of pink present on this hydrangea at any one time, Vanille Fraise is perfect for adding colour to in the late summer border and is particularly useful for north facing gardens where it will add colour and light. Vanilla Fraise also makes a great cut flower and the glorious heads can also be dried and sprayed for a stunning winter decoration. Very hardy and easy to grow, the loose cone-shaped clusters of blooms form at the tips of red-stemmed branches in summer. Hydrangeas love to be kep well watered - don't allow pots to dry out and water borders regularly. Makes a stunning, informal hege when a number are planted together. Prune hard in early spring to encourage flowering. Cut back the previous season's shoots to within a few buds of the permanent, woody framework of the plant.